Gloss pigment fusing foil are used to add colored text or images to dark papers, such as adding white to a black paper. They have toner-receptive adhesive on one side that sticks to dry toner*. Pigment reactive foils may have a "color shift" when foil fused, meaning the color of toner you print will affect the final look, so we recommend testing. Use one of our compatible foil fusing machine to apply even and consistent heat to apply the foil to your toner. This foil can stick to smooth paper stocks of many thicknesses**. 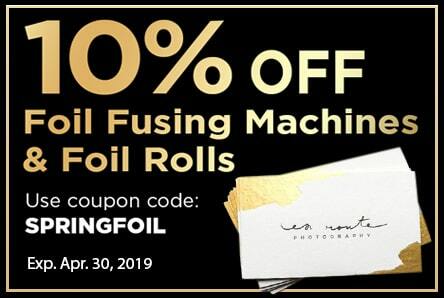 Note: If you are using one of our Foil Fusing Machines, please select the 24" x 500' roll size, as they feature the 1" core that is required for use with the machines. You may need to use the foil roll cutter (or order custom cut rolls by calling (866)537-2244 (866)537-2244 ), depending on your machine width capabilities. * Foil rolls stick to dry toner only - does not work with wax based inks from laser printers. Gloss pigment fusing foil have a special toner receptive adhesive on the back that sticks to the dry toner that is used in most black and white copiers and laser printers (the foil will not adhere to wax based inks from laser printers*). Unlike metallic foils that are completely opaque, pigment foils may have a "color shift" when foil fused. The color shift is affected by the underlying toner color, meaning the color of toner you print and stick these foils to will affect the final color. We recommend that customers print a test sheet with colored toner bars ranging from yellow across the color range to black. After the color bars have been printed, run the sheet through a foil fusing machine using the pigment color foil. This will allow customers to gauge the amount of color shift they can expect with a give color of pigment foil fused over a specific color of toner. Keep these test sheets for future reference. 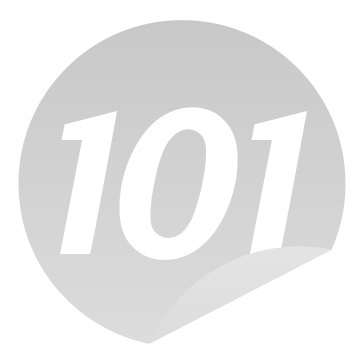 Other heat machines, such as pouch laminators, might work with toner adhesive foiling rolls as well, however, may require more heat testing and adjusting to get a perfect finished print, and they are not guaranteed to work. This foil can stick to smooth paper stocks of many thicknesses; it does, however, have problems sticking to textured papers**. Q: I need help troubleshooting. Our troubleshooting tips have been helpful determining the problem causing an improper foil, as well as helping fix the issue. Foiling with a laminator is a popular method, but not all laminators will work well. Here is a list of the top 4 best laminators for foiling. Q: Ink got on my carrier and onto my paper...how can I stop this? If the toner that is not covered with foil transfers to the pouch carrier, you can prevent it from then transferring onto your projects by covering the toner not being foiled with a blank piece of paper.